Some of you may know her as Dria from the Gunslinger Forums, but many of you undoubtedly have chatted with her under the name TheCakeisaLIE. The Gunslingers have had the fortune to count her as a member for some time now, and it is high time we get to know her better! With that in mind, enjoy the following interview that will shed some light as to why her chat handle is quite apt. GS: You joined the Gunslingers back in May, 2011. How exactly did you happen upon us, and was there a particular game that brought you here? Dria: Not any particular game really. I joined after my boyfriend (Sosyc) told me about the site and I had recently given up my MMO at the time and was looking for something to give me the social aspect that I enjoy. After reading over the forums and the diversity of games and systems and then after spending time in the chat room I was hooked! GS: Obviously, you like gaming, but what people may not know is that you have formal training in the culinary arts. How long have you been doing that, and when did you first realize decorating cakes is something that interested you? Dria: I went to culinary school several years back. My family spends a lot of time watching food network, which had gotten my attention from the various cake challenges. I had been working at a toy store before that and felt I wanted to get out of retail. I always loved desserts and the artist aspect of cake decorating was super fun, challenging and something I felt I could do and enjoy. GS: Based on the pictures, you have created some really complex cakes. Can you tell us how the process of molding objects out of sugar works? Dria: Well for things like wedding or tiered cakes its always best for me to start out with a sketch of my idea based on either a theme or color scheme. Then I can make a list of what is needed for that cake in decorative aspects, e.i. Flowers, bows, bubbles, swags, or things of that nature. Sometimes it takes a couple days to make those before you even bake the cake. If its a fondant cake you can color the fondant yourself by kneading a gel coloring into white fondant, or you can buy pre-colored, or you can choose to airbrush (I prefer self coloring) after all that its just a matter of assembly. GS: What was the most elaborate or hardest piece you have made, and how long did it take? bubbles, kelp and shells. It took around three days. Sugar can be temperamental depending on humidity and how heavy handed you are. It requires a very delicate touch and good eye for assembly keeping in mind balance issues for when the piece is moved. I have a bad habit of wiggling my piece after attaching a few things to make sure things aren’t going to fall off. On the flip side, that piece didn’t fall apart until three and a half years later. GS: According to your GS profile, reading is listed as one of your other interests. What genre do you most often read? Do you have any favorite authors? Dria: Fantasy and Science Fiction are my go-to genre’s. Though I enjoy historical fiction, biographies, and I did go through a kick for a year or so that I read a lot of westerns. My favorite author at the moment…. a three way tie. Lois Mcmaster Bujold, Mercedes Lackey, and Terry Pratchett. GS: In addition to being a culinary artist, you also dabble in drawing. Has that been a life-long interest, or is that something you have recently picked up? Dria: Life long interest! Always thought when I was a kid that I wanted to be an illustrator for novels. Did competitions when I was in high school and ended up with a sculpture piece in Athens for a few months because of it. Don’t draw or paint so much now. I’m horribly out of practice. GS: Being from Georgia, what are some favorite places that you could recommend to the tourists among us? Dria: Technically I’m not really from Georgia. I grew up in Germany on a military base.Though I think that it gives me a better look at Georgia by not being from here. From what I have discovered of Georgia, Jekyll Island was a lot of fun to visit, River Walk in Savannah is beautiful plus the city of Savannah itself is interesting to walk through. The apple houses of north Georgia was very neat to visit with lots of fresh apple cider. North Georgia also has the Appalachian mountains that are scenic and with trout streams! Atlanta has an amazing symphony plus the High Museum of Art. Not to mention all the amazing restaurants with a very diverse culture. GS: Your significant other, Sosyc, and you both enjoy gaming. How is it like being a gaming couple? Who gets dibs on the television? Dria: We share a lot of the same interests so it works out very nicely. We enjoy the same shows and games for the most part. I like watching him play games as well as playing myself. I love being a gaming couple! He does tease me about my facebook app games, which they are silly but I still enjoy. I used to play Neopets too (though I don’t admit to it very often) There are alot of co-op games that we have such Borderlands, Dirt3, Portal 2, and Dungeon Defenders. And we have a lot of characters we play seperately on Skyrim, Fallout, 3d Dot Game Hero and Brink. GS: Do you have any pets? If so, can you tell us something about them? Dria: I have one pet, a ten pound white peke-a-poo named Murphy. He’s eleven years old now but still plays like a puppy. He’s a strange little dog who has a lot of cat like tendencies. GS: And, most importantly, what is your favorite drink? Dria: Vanilla Coke most assuredly! Thank you for taking the time to do this interview, and thank everyone for reading it. Most importantly, thank you for being a Gunslinger, Dria! 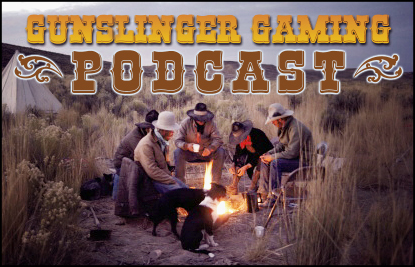 Next Post: The Results of the 2011 Gunslinger Games Awards Are In!